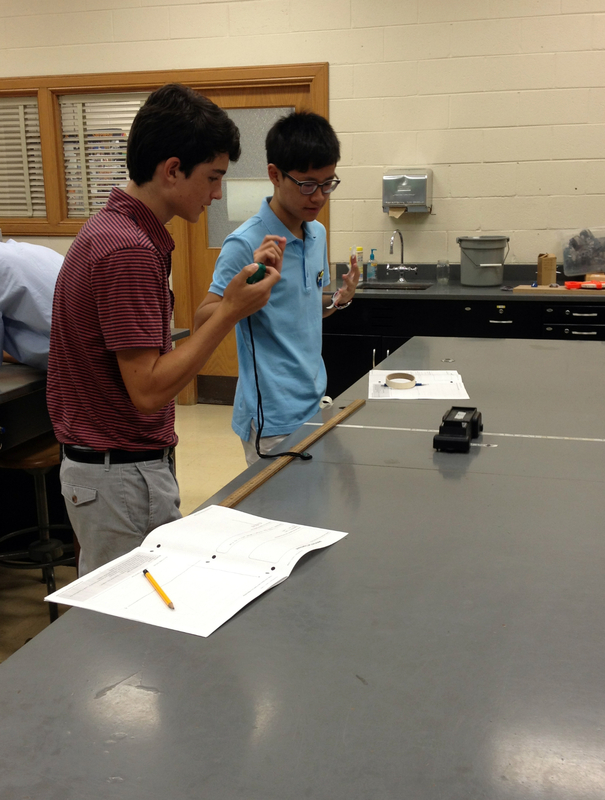 Building the Constant Velocity Model – Physics! Blog! Hey guys, I want to show you something cool. Let’s go next door. Cool. 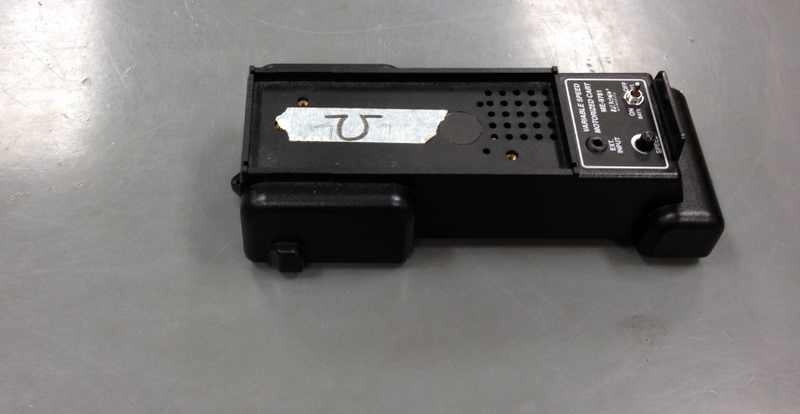 [I flip the switch on the cart. 1] Start. [The cart moves pretty slowly across the table in front of me. I watch it carefully.] Stop. [I turn off the cart. I look up at them.] Whoa. You want to see that again? Huh. So, we’ve gotten a pretty good description of this motion in words. I think a great next step in understanding this cart would be to get a more quantitative description. For that, we’d need to do an experiment. So. 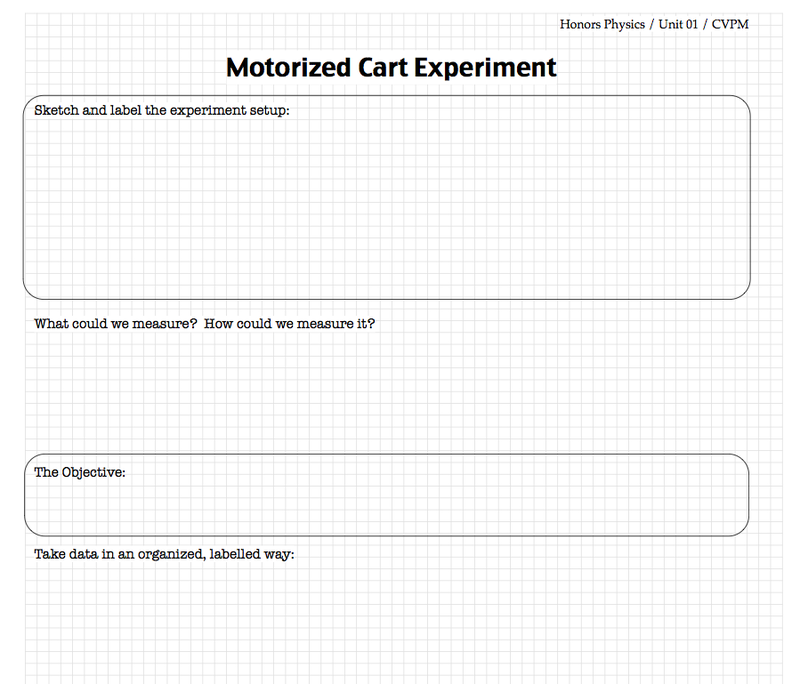 What can we measure about the motion of the cart? But also, what tool would we use to measure it? We don’t have a lot of time today, and this is our first experiment, so ideally we will use tools that are easily found in the lab and that we are mostly familiar with already. There’s a space to write this down in your packet on the inside of the front page. Don’t worry about the sketch just yet. You’ll have time to do that later. (Distance, ruler.) Great. Has everyone used a ruler before? And we have a bunch of those, so we can definitely use that tool. (Time, stopwatch.) Sure. Has everyone used a stopwatch before? And we have a drawer full of them right over here. Okay. We’re getting close, now! There is one thing I have a suggestion about. So, I’m thinking about how in a few minutes, we’re going to split up and do experiments in different places. After, we’ll want to compare our data to each other. So I was thinking, maybe instead of just using distance, we should do a measurement that we could compare to each other. Like, if we all agreed on the same place that was zero, even if we didn’t start there. But it would be the same zero for everyone. That way we could compare where each cart was in a more meaningful way. So instead of distance, it would be more like where you were on a number line. [Draw a number line on the board.] We would just need a common zero. An, uh, what do you call the zero on the number line in math? (Oh, um, the origin.) Yeah, a common origin. Oh, hey! There’s an origin already taped across the room that we could use. Wow, that’s convenient! So I guess, besides just an origin, we also need to say which was is positive and which way is negative, right? So let’s say toward physics is positive, toward chemistry (the chemistry lab is next door) is negative. For obvious reasons. So is it fair for us to measure position instead of distance? (Sure.) It’s pretty similar. I think it still keeps the spirit of what you meant by distance, but just allows us to compare data more easily in the end. So now we’re down to position (ruler) and time (stopwatch) for our measurements, right? What relationship are we trying to determine? What is our objective for this experiment? To find a relationship between what and what? (Distance and time. I mean, position and time.) Okay. So we’re finding a relationship between position and time for the motorized cart. You can write the objective down on the experiment page in the packet. What should we do with the data? So what are you going to measure, again? (Position and time.) Right. And so you’re going to take a bunch of data points, then where will you put them all? (In a data table?) Good idea. So what will go in the data table? (Uh, position… and time…) Okay. So let’s choose symbols for those things that will help us remember which is which. (x and y.) I think we can be even more specific. Okay, I think you all have an idea now of one way to take this data, right? In a moment, not yet, let’s do groups of two or three. The carts, tape, and stopwatches are over here. The metersticks are over by the hood. Remember not to change the speed dial on the cart, even though it is incredibly tempting to do so. There might be a group in another class that isn’t finished taking data, and you don’t want to ruin their experiment. [The following bits are said to individual groups when appropriate as they are graphing. I don’t make these as general announcements at all.] This graph is the only one for an experiment that I will ask you to plot by hand this year, so let’s do a really careful job with it. 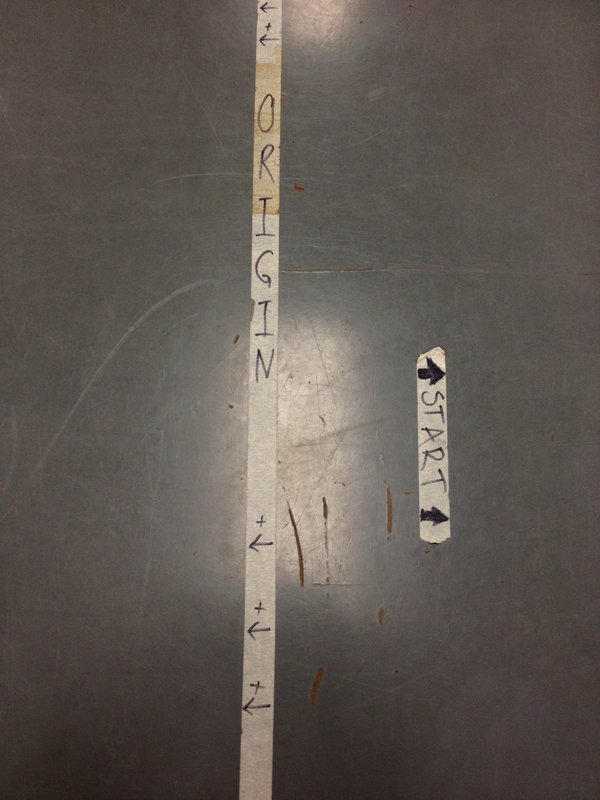 Make sure you are using a ruler to draw a single best fit line. Don’t connect the dots. Don’t just connect the first and last data points. 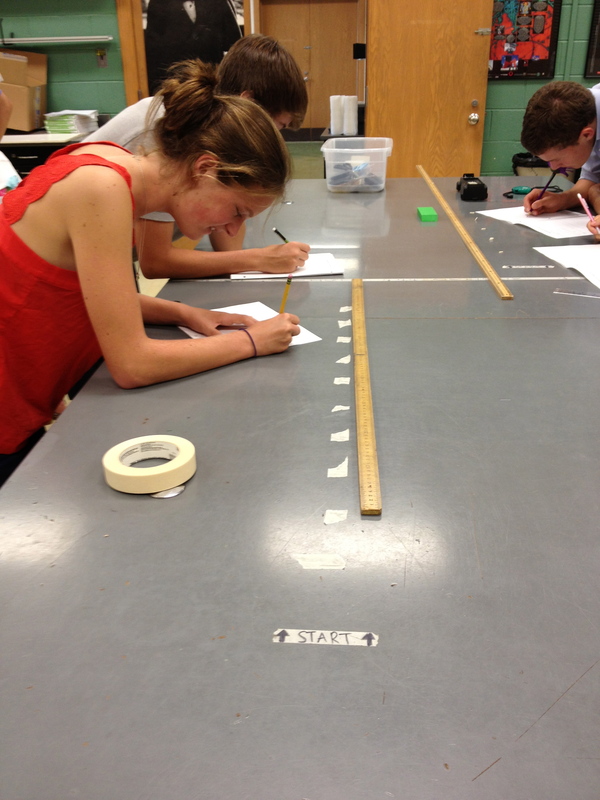 Try to line up the ruler so that it gets as close to every data point as possible. There are more precise ways to do this work, but the eyeballed best fit line will be good enough, here, I think. Once you have the line drawn, imagine that your data points have disappeared so that the only thing on your graph is the line. Find points on the line (not your data points) to find the slope. Use the variables on the graph (x and t) for your equation. Don’t default to x and y. There is no y-axis on the graph you’ve drawn. Be sure to put units on the numbers in your equation, but not on the variables. That is, the slope and intercept should both have units. Go back and put units in your work to see what they should be. When you are finished making your graph, go ahead and clean everything up. Then, grab a whiteboard and make a sketch of the shape of your graph. Sketch, not plot. Don’t make tick marks. No rulers or metersticks allowed. Just a really quick sketch, then write the equation of your line. When we are all finished, we’ll get together and have a board meeting (ha ha). Okay, go ahead and sit on top of the tables in the circle. We will show everyone’s boards at once, and we’ll look to see what’s the same and what’s different. After a few experiments, you won’t really need me to lead this anymore because you will be able to have the conversation yourselves, but I’ll help a bit this time. In general, you want to talk to each other, not to me. So. What’s the same about everyone’s boards? [At this point, the responses can be all over the map. Eventually, you’ll get to some more substantial answers, like, “they are all lines.”] So everyone got a linear relationship? (Yeah.) Oh! That seems pretty significant. We were looking for the relationship between position and time for the cart, and everyone found that relationship to be linear, even though they were using different carts. Cool. So what’s different about everyone’s boards? [Hopefully they will talk to each other a bit about how the slopes are different, the signs of the slopes are different, and the intercepts are different. Then we can dig into what each of those differences represents. Asking, “Who had the fastest cart? Who had the slowest cart?” can help a lot. Eventually, we get to the idea of the slope telling both the speed and the direction of the motion. When we’re there, we wish for a word that meant both parts of that info, and we get velocity.] Sweet. It seems like we’ve defined this relationship pretty well at this point. Let’s try using it in new problems! Next, we might have a really brief discussion that pulls together the pieces of our model (the verbal piece from our observations, the features of the evenly-spaced “breadcrumb” motion map on the table, the position-vs-time graph features). Maybe 2 or 3 minutes, there. Then on to working some problems in the packet. I let them encounter the velocity-vs-time graphs on their own. They get confused and nervous for a small time, but they can figure it out pretty easily (especially if they are using the collaborative work correctly and arguing at their tables). Within a day or two, we’re Mistake Gaming the problems with whiteboards. And in general, we are also wrapping up the unit as quickly as possible. We’ll come back to everything in this model when we build the constant acceleration model in a couple of weeks. We want to move into forces as quickly as possible and start explaining, not just describing, with our nascent physics powers. 1. The cart in my photo is the crazy-expensive PASCO version. There is a cheaper (but less straight-line-going, I hear) cart that has been oft-discussed on Modeling Instruction listservs. 2. I might also just let each group decide on their own. I might do a hybrid, making a suggestion of what we usually do, but giving them the freedom to make their own choices. In general, I haven’t found that giving them the choice here is worth the time unless it’s a group that I am pretty sure is going to be able to deal with the graphs being different (and therefore the slopes and intercepts meaning different things) during the discussion really efficiently and easily. (A group this year decided to go rogue on the graph, but quickly realized that you could compare it to the others if you rotated the board, then pretended to look at it through the back of the not-transparent board—not every class is going there on day 1 though!) Even though it’s the first day of class, knowing my students pretty well before they get here (small boarding school + working on freshman dorm) can help me make that call in the moment. It just varies from class to class. Readings I’m using in Various Science Teaching and Learning Courses « Teach. Brian. Teach. Thank you for this. I really like reading your dialogue. It seems very natural, but you do a nice job guiding the direction of the conversation without stifling their thoughts! How did you remember the dialogue well enough to create this “transcript”? Thanks! I’d consider this an “average” or maybe “typical” transcript (but not an actual transcript). I think just doing it 4 times per year for several years was enough to be able to think it through and write it down later. Each of these classes varies a bit, of course, but this is just a good approximation of any one of them. I really liked how you presented this and did it with my students last month. It went great! I’m a 2nd year physics teacher and am learning a lot from your blog. Thank! Kelly, My name is CaraLee Heiser and I have so many questions for you, I don’t know where to start. Would you mind emailing me?